SYNOPSIS: From the team that brought the “Pirates of the Caribbean” trilogy to the big screen, Walt Disney Pictures and Jerry Bruckheimer Films present PRINCE OF PERSIA: THE SANDS OF TIME, an epic action-adventure set in the mystical lands of Persia. A rogue prince (JAKE GYLLENHAAL) reluctantly joins forces with a mysterious princess (GEMMA ARTERTON) and together, they race against dark forces to safeguard an ancient dagger capable of releasing the Sands of Time—a gift from the gods that can reverse time and allow its possessor to rule the world. REVIEW: Summer films in general are well known for their undeveloped non sense screenplays; however at the same time those same summer films manage to overcome the grant majority of their flaws by displaying and extravaganza of action and special effects making those films highly entertaining, but not memorable. 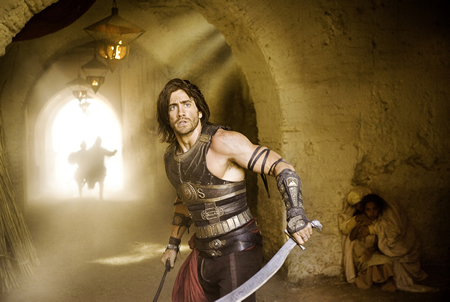 This is the case of Prince of Persia: Sands of Time, a highly anticipated film that fells short in challenging audience’s brains with a weak story line, but that manages to produce enough entertainment to make it an acceptable summer movie. Saying that Prince of Persia is a waste of time or a complete failure is not true and it won’t be fair for the cast and Jerry Bruckheimer, the effort is visible for the most part of the film; however more was expected. Visually speaking the film has all the ingredients of a Jerry Bruckheimer production, meeting the minimum requirements of a typical summer blockbuster. Amazing stunts, good visual effects and intense fighting scenes are just the only working elements in favor of Price of Persia. The cast in general helps the film overcome it weakness; however they didn’t have any relevant material to perform at a higher level. The only one that was able to make the best out of this non-sense screenplay was Alfred Molina in his role of Sheik Amar, who gave the film something to smile about. Overall Prince of Persia: Sands of Time disappoints because it was one of the most anticipated movies of the season and it failed to deliver as a whole; nevertheless the film provides enough entertainment to be considered a decent choice this summer.